This holiday season I enjoyed giving, receiving, and playing several new card and board games with friends and family. 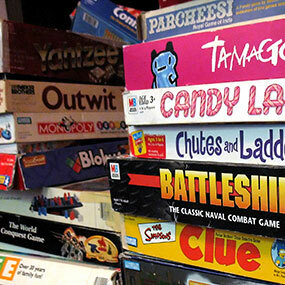 These included classics such as cribbage, strategy games like Dominion and Power Grid, and the whimsical Munchkin. Can video and board games teach us more than just strategy? What if games could teach us not to be better thinkers, but just to be… better? A while ago we discussed how monopoly was originally designed as a learning experience to promote cooperation. Lately I have learned of two other such games in a growing genre and wanted to share them here. In the game, the players read typewritten instructions. The game board is a set of train tracks with box cars, sitting on top of a window pane with broken glass. There are little yellow pegs that represent people, and the player’s job is to efficiently load those people onto the trains. A typewriter sits on one side of the board. The game takes anywhere from a minute to two hours to play, depending on when the players make a very important discovery. At some point, they turn over a card that has a destination for the train. It says Auschwitz. At that point, for anyone who knows their history, it dawns on the player that they have been loading Jews onto box cars so they can be shipped to a World War II concentration camp and be killed in the gas showers or burned in the ovens. I have tried creating my own board games in the past, and this gives me renewed interest and a higher standard. What is the most thought-provoking moment you have experienced playing games?